Land Rover Range Rover Sport 5.0 V8 S/C 575 SVR 5dr Auto 2019 Review | What Car? It’s all about the performance treatment here. The SVR model comes with a bodykit, specially tuned suspension and brakes, figure-hugging sports seats, quad exhaust pipes and bespoke 21in wheels. As if to prove its on-road credentials, it is available with 22in wheels with high-performance road tyres. The SVR model is the full-house, go-faster model. 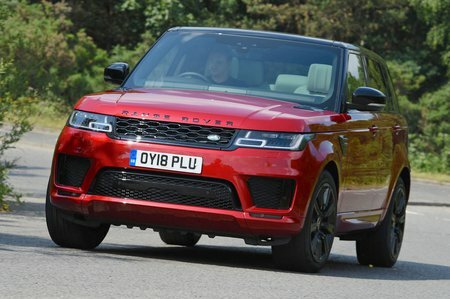 It can be toned down sufficiently when required, but turn up the wick with the sportiest modes and it becomes unashamedly noisy and extravagant, and makes the Range Rover Sport indecently fast for something so big. Be prepared to shell out on fuel, though, because for a realistic real-world average expect 18-19mpg, with maybe 22mpg on a good day. It's worth bearing in mind that an Audi SQ7 handles better, rides better and is cheaper to buy and to run.